Peter Philips is the one first-rate Elizabethan composer who remains largely unknown today, even to specialists. His modern reputation has suffered from a form of musical chauvinism that works to the disadvantage of émigrés: he left England at an early age, never to return, so he has been ignored by English musicologists, and equally he has been treated as a foreigner by their colleagues in his adopted country, the Spanish Netherlands (now Belgium). As a result, only a small amount of Philips’s music has found its way into print in this century, and less of it has been recorded. Yet it is equal in quality to the best work of that richly productive period. His keyboard music invites comparison with Byrd, his consort music with Dowland, his motets and madrigals with Gibbons and Weelkes – or rather with Lassus and Marenzio, because his vocal music in particular belongs to the cosmopolitan European tradition. Philips was born in 1560 or 1561, presumably in London. He was a choirboy at St Paul’s Cathedral and in 1582 received a legacy from Sebastian Westcote, the recusant Catholic who was almoner and choirmaster there. He had begun to compose while he was still at St Paul’s: a pavan of his is dated 1580 in the Fitzwilliam Virginal Book with the comment ‘The first one Philips made’. A few months after Westcote’s death Philips left England for good, apparently because he was a Catholic. He travelled first to the English Catholic community at Douai, and then went on to Rome where he worked at the English College. In 1585 Philips entered the service of the Catholic exile Lord Thomas Paget, and travelled with him to to France, Spain and the Netherlands, settling in Brussels in 1589. After Paget’s death in 1590 Philips moved to Antwerp, where he ‘mainteyned himself by teachinge of children of the virginals, being very cunning thereon’, and published his first collections of madrigals. In 1597 he entered the service of Archduke Albert, regent of the Spanish Netherlands, as one of the organists of the Brussels court chapel; he remained there for the rest of his life. In his later years he devoted himself largely to sacred music, though there is no evidence that he became a priest as is often said. He died in 1628. Most of the music on this record was published in two large collections, Cantiones sacræ, pro præcipuis festis totius anni et communi sanctorum (Antwerp, 1612) and Cantiones sacræ octonis vocibus (Antwerp, 1613), the former in five parts, the latter in eight. They were dedicated respectively to the Virgin Mary and Saint Peter, and they contain polemical dedications attacking heresy – in, presumably, his native land: ‘To you therefore, Leader, Prince, Father, Shepherd, Rock,’ he wrote in 1613, ‘whom the whole Church celebrates in song wherever it is in harmony in heaven and on earth (only the discord of heresy snarls at you in disparagement), to you, the preserver of concord and conqueror of discord, in discordant accents I dedicate and consecrate concordant notes.’ The two sets were originally published as unaccompanied choral music, but Philips experimented with organ parts in the two- and three-part motet collections published in 1613 and 1616, and republished the 1612 set with a continuo part in 1617; a second edition of the 1613 set with a continuo part appeared in 1625. The last piece on this record, the Litania duodecima, comes from Litaniæ Beatæ Mariæ Virginis, in ecclesia Loretana canisolitæ (Antwerp, 1623). Only two voice-parts of this collection have survived, but the two-stave basso continuo allows the rest to be supplied with some confidence; I am grateful to Dr Lionel Pike for the use of his fine unpublished reconstruction. Not much is known about performing conditions in the Brussels court chapel. Sixteen singers were on the payroll, as well as the maître de la chapelle and two or three organists who probably sang when they were not playing. There is no mention of any instrumentalists, but the secular court musicians during Philips’s lifetime included ‘fagotistes’, harpists, viol players (including the Englishman Daniel Norcombe) and lutenists, some of whom are also described as members of the chapel. We have laid out the scoring of the continuo using these instruments, taking into account the practice of Spanish churches; as we might expect, there were strong musical ties at the time between Spain and its colony in the Netherlands. We have divided the single continuo part of Philips’s eight-part motets into two, one for each group, following a well-established practice in Italy and Germany. For instance, Giovanni Gabrieli’s polychoral motets were printed with a single figured bass in the original prints, but some of them survive in German manuscript sources with divided continuo parts. John Steele has pointed out (Aspects of Keyboard Music: Essays in Honour of Susi Jeans, Oxford, 1992, p141) that Philips’s two sets of Cantiones sacræ are ‘the most substantial corpus of Latin choral motets by any English composer with the sole exception of William Byrd’. Yet there are few signs of his English training in the collections, and they should be compared rather with the music that he would have come across in Rome by, among others, Palestrina, Victoria, Soriano, and Felice Anerio, who was maestro di capella at the English College 1584/5. 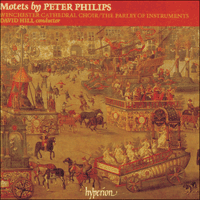 Certainly, Philips’s eight-part motets are relatively conservative compared with the most advanced works of the time by, say, Gabrieli, Schütz and Michael Praetorius, with their use of high- and low-pitched choirs, and their writing for solo voices and obbligato instruments. There is plenty of traditional counterpoint in the double-choir motets recorded here. Hodie concepta est, for instance, has a good deal of dense imitative eight-part writing, though it ends with lively alleluias thrown in block chords from choir to choir, while Salve regina opens with a discussion of the opening phrase of the plainsong before proceeding to more typical double-choir writing. By and large, however, they rely for their effect on contrast – between the two choirs, between the alternation of duple and triple time, and between slow-moving passages in semibreves and minims and faster-moving ones in crochets and quavers. A motet such as Ecce vicit Leo is almost entirely homophonic, with a brilliant repeated-note figure at the words ‘et benedictionem’, derived from Renaissance battle music. Philips’s nine-part Litany is also largely homophonic and contrasts a high-pitched four-part choir against a low-pitched five-part one, the choirs taking respectively the roles of the priest and the people in the responses. In the hands of a lesser composer the constant repetitions of ‘ora pro nobis’ could easily become tedious, but Philips effortlessly keeps up the interest by varying the rhythmic patterns and by constantly cadencing in different keys. Peter Philips est le seul compositeur élisabéthain de premier ordre qui soit resté presqu’inconnu de nos jours, même des spécialistes. Sa réputation contemporaine a souffert d’une forme de chauvinisme musical qui désavantage les émigrés: il quitta l’Angleterre très jeune, pour ne jamais y revenir, aussi il est passé sous silence par les musicologues anglais et traité en étranger par leurs collègues dans son pays d’adoption, les Pays-Bas espagnols (actuellement la Belgique). Le résultat, c’est que très peu de la musique de Philips a été imprimée au XXe siècle, et encore moins enregistrée. Mais elle est d’une qualité égale aux meilleures œuvres de cette période très riche. Sa musique pour clavier peut se comparer à celle de Byrd, sa musique pour ensemble de musique de chambre à celle de Dowland, ses motets et madrigaux à ceux de Gibbons et de Weelkes – ou plutôt de Lassus et Marenzio, car sa musique vocale, en particulier, s’inscrit dans la tradition européenne cosmopolite. Philips était né en 1560 ou 61, probablement à Londres. Il fut choriste à la Cathédrale St-Paul et, en 1582, reçut un legs de Sebastian Westcote, catholique réfractaire qui était aumônier et maître de chapelle de la cathédrale. Il avait commencé à composer à St Paul: une pavane, datée de 1580, figure dans le Fitzwilliam Virginal Book avec la mention «La première que fit Philips». Quelques mois après la mort de Westcote, Philips quitta l’Angleterre pour toujours, probablement parce qu’il était catholique. Il se joignit d’abord à la communauté catholique anglaise de Douai, puis alla à Rome travailler au Collège anglais. En 1585, Philips entrait au service de Lord Thomas Paget, exilé catholique, et l’accompagnait dans ses voyages en France, en Espagne et aux Pays-Bas, s’établissant à Bruxelles en 1589. Après la mort de Paget, en 1590, Philips alla vivre à Anvers où il «gagna sa vie en enseignant aux enfants le virginal, auquel il était très habile» et publia ses premières collections de madrigaux. En 1597, il entrait au service de l’Archiduc Albert, Régent des Pays-Bas espagnols, comme organiste à la chapelle de cour de Bruxelles, où il resta jusqu’à sa mort. Pendant ses dernières années, il se consacra surtout à la musique sacrée, mais il n’est pas prouvé qu’il soit devenu prêtre, comme on le dit souvent. Il mourut en 1628. La plus grande partie de la musique de cet enregistrement fut publiée dans deux grandes collections, Cantiones sacræ, pro præcipuis festis totius anni et communi sanctorum (Anvers, 1612) et Cantiones sacræ octonis vocibus (Anvers, 1613), la première à cinq voix, la dernière à huit voix. Elles étaient dédiées respectivement à la Vierge Marie et à Saint Pierre, et renferment des dédicaces polémiques attaquant l’hérésie – dans son pays natal, vraisemblablement: «À vous donc, Dirigeant, Prince, Père, Berger, Rocher,» écrivait-il en 1613, «que toute l’Eglise célèbre dans ses chants, et partout dans ses harmonies, au ciel et sur terre (seule la dissonance de l’hérésie vous dénigre de sa hargne), à vous, le protecteur de l’harmonie et le vainqueur du désaccord, en accents peu harmonieux, je dédie et consacre des notes harmonieuses.» Les deux albums furent publiés à l’origine comme musique chorale non accompagnée, mais Philips essaya d’y ajouter des parties d’orgue dans les collections de motets à deux et trois voix publiées en 1613 et 1616 et publia de nouveau la collection de 1612 avec une partie de continuo en 1617; une seconde édition de la collection de 1613 avec une partie de continuo parut en 1625. Le dernier morceau de cet enregistrement, la Litania duodecima est tirée des Litaniæ Beatæ Mariæ Virginis, in Ecclesia Loretana canisolitæ (Anvers, 1623). Deux parties vocales seulement de cette collection ont survécu, mais la basse continuo sur deux portées permet d’ajouter le reste sans grand problème; je suis reconnaissant au Dr Lionel Pike qui nous a permis d’utiliser sa belle reconstitution inédite. On sait peu de choses au sujet des conditions d’exécution dans la chapelle de la cour de Bruxelles. Seize chanteurs étaient inscrits au registre des salaires ainsi que le Maître de Chapelle et deux ou trois organistes qui chantaient probablement lorsqu’ils ne jouaient pas. Aucun instrumentiste n’est mentionné, mais les musiciens de cour laïques du vivant de Philips comprenaient des «fagotistes», harpistes, joueurs de viole (y compris l’Anglais Daniel Norcombe) et luthistes, dont certains sont qualifiés de membres de la chapelle. Nous avons établi la partie de continuo en utilisant ces instruments, tenant compte de l’usage des églises espagnoles; comme on pourrait s’y attendre, il existait des liens musicaux étroits à l’époque entre l’Espagne et sa colonie des Pays-Bas. Nous avons divisé en deux la partie unique de continuo des motets à huit voix de Philips, une pour chaque groupe, selon une coutume établie en Italie et en Allemagne. Par exemple, les motets polychoraux de Gabrieli étaient imprimés à l’origine avec une basse chiffrée unique, mais certains ont survécu dans des manuscrits allemands avec des parties de continuo divisées. John Steele a fait remarquer (Aspects of Keyboard Music: Essays in Honour of Susi Jeans, Oxford, 1992, p.141) que les deux séries de Cantiones sacræ de Philips «représentent le recueil le plus important de motets choraux en Latin par un compositeur anglais, avec la seule exception de William Byrd». Cependant, ces collections révèlent peu de traces de sa formation en Angleterre et on devrait plutôt les comparer à la musique qu’il avait pu entendre à Rome, par, entre autres, Palestrina, Victoria, Soriano et Felice Anerio qui était maestro di capella au Collège anglais en 1584/5. Certes, les motets à huit voix de Philips sont de style relativement traditionnel, si on les compare aux œuvres les plus avancées de l’époque par Gabrieli, Schütz et Michel Prætorius, par exemple, avec leur utilisation de chœurs aigus et graves et leur écriture pour voix en solistes et instruments obbligato. On trouve beaucoup de contrepoint traditionnel dans les motets pour deux chœurs enregistrés ici. Hodie concepta est, par exemple, présente une écriture serrée et imitative à huit voix, mais s’achève avec des alléluias joyeux, lancés en accords d’un chœur à l’autre et le Salve regina commence par une discussion de la première phrase du plain-chant avant de passer à une écriture plus typique pour deux chœurs. Mais en général, l’effet produit dépend d’un contraste: entre les deux chœurs, entre l’alternance de mesures à deux et à trois temps, et entre des passages lents en rondes et en blanches et des passages plus rapides en noires et en croches. Un motet comme Ecce vicit Leo est presque complètement à l’unisson, avec un motif brillant de note répétée sur les mots «et benedictionem», dérivé de la musique de bataille de la Renaissance. La Litanie à neuf voix de Philips est aussi en grande partie à l’unisson et oppose un chœur aigu de quatre voix à un chœur de basse à cinq voix qui incarnent respectivement les rôles du prêtre et de la congrégation dans les répons. Aux mains d’un moins bon compositeur, les répétitions constantes d’«ora pro nobis» pourraient facilement devenir fastidieuses, mais Philips maintient l’intérêt sans effort en variant les rythmes et en changeant sans cesse de clef pour ses cadences. Peter Philips ist der einzige erstrangige Komponist der elisabethanischen Zeit, der selbst unter Fachleuten heute noch relativ unbekannt ist. Sein Ruf in der Neuzeit hat unter jener Art von Patriotismus zu leiden gehabt, die Emigranten schon immer in Nachteil geraten ließ. Da er England schon in jungen Jahren auf immer verließ, schenkten ihm englische Musikwissenschaftler wenig Beachtung. Gleichzeitig blieb er aber auch für deren Kollegen in seiner Wahlheimat, den Spanischen Niederlanden (dem heutigen Belgien), immer nur ein Ausländer. Infolgedessen wurden in diesem Jahrhundert nur wenige seiner Kompositionen veröffentlicht und noch weniger ausgenommen. Dabei kann Philips Musik es mühelos mit den größten Werken dieser so schaffensfreudigen Ära aufnehmen. Seine Kompositionen für Tasteninstrumente laden zum Vergleich mit denen von Byrd ein, seine Consort-Musik mit der von Dowland, und seine Motetten und Madrigale können dem Vergleich mit denen von Gibbons und Weelkes mühelos standhalten – oder vielleicht sollte man sie eher mit denen von Lassus und Marenzio vergleichen, denn gerade seine Vokalmusik steht in der kosmopolitischen, europäischen Tradition. Philips kam im Jahre 1560 oder 1561, vermutlich in London, zur Welt, wo er später auch Sängerknabe in der St. Paul’s Cathedral war. 1582 fiel ihm eine Erbschaft von Sebastian Westcote zu, dem Chorleiter und Almosenpfleger der St. Paul’s Cathedral, der ein überzeugter Katholik geblieben war. Schon in seiner Zeit als Sängerknabe hatte Philips zu komponieren begonnen: Im Fitzwilliam Virginal Book ist eine Pavanne von ihm mit 1580 datiert und mit dem Vermerk versehen: „Die erste, die Philips komponierte“. Wenige Monate nach Westcotes Tod verließ Philips England auf immer, anscheinend aufgrund seines katholischen Glaubens. Er reiste zunächst zur englischen katholischen Gemeinde in der französischen Stadt Douai und fuhr dann nach Rom weiter, wo er am englischen Kollegium arbeitete. Im Jahre 1585 trat er in den Dienst des katholischen Exilanten Lord Thomas Paget, mit dem er nach Frankreich, Spanien und in die Niederlande reiste, bevor er sich 1589 in Brüssel niederließ. Nach Pagets Tod im Jahre 1590 zog Philips nach Antwerpen; er verdiente dort seinen Lebensunterhalt, indem er „Kinder im Spielen des Virginals unterwies, das er selbst ausgezeichnet beherrschte“, und er veröffentlichte seine ersten Madrigalensammlungen. 1597 trat Philips als einer der Organisten der Hofkapelle zu Brüssel in den Dienst von Erzherzog Albert, dem damaligen Regenten der Spanischen Niederlande, wo er bis zu seinem Tode blieb. In seinen reiferen Jahren widmete sich Philips in erster Linie der Komposition von Kirchenmusik; allerdings gibt es für die häufig aufgestellte Behauptung, er sei auch in das Priesteramt eingetreten, keine Beweise. Philips verstarb im Jahre 1628. Der Großteil der Werke auf dieser Aufnahme erschien ursprünglich in Form von zwei großen Sammlungen, und zwar der Cantiones scaræ, pro præcipuis festis totius anni et communi sanctorum (Antwerpen, 1612) in fünf und der Cantiones sacræ octonis vocibus (Antwerpen, 1613) in acht Stimmen. Diese Werke sind mit teilweise sehr polemisch formulierten Vermerken der Heiligen Jungfrau Maria bzw. dem Heiligen Petrus gewidmet, und Philips spricht sich darin gegen die Heresie – vermutlich die in seinem Heimatland – aus: „Dir, darum, Führer, Prinz, Vater, Hirte, Felsen“, schreibt er 1613, „dem die gesamte Kirche, wo immer sie Dir im Himmel und auf Erden mit harmonischem Gesang huldigt (nur die Mißklänge der Heresie geifern und schmälern Deine Glorie), Dir, dem Erretter der Eintracht und dem Sieger über die Zwietracht, Dir widme und weihe ich die disharmonischen Klänge harmonischer Musik.“ Die beiden Sammlungen erschienen in ihrer Originalfassung als Chormusik ohne Begleitung, aber in den Sammlungen drei- und vierstimmiger, im Jahre 1613 bzw. 1616 veröffentlichten Motetten experimentierte Philips mit Orgelstimmen und brachte die Sammlung von 1612 im Jahre 1617 mit einem Continuo-Part neu heraus; eine Zweitausgabe der Sammlung von 1613 mit Continuo-Part erschien im Jahre 1625. Das letzte Stück auf unserer Aufnahme, die Litania duodecima, stammt aus der Litaniæ Beatæ Mariæ Virginis, in ecclesia Loretana canisolitæ (Antwerpen, 1623). Nur zwei Singstimmen aus dieser Sammlung sind in der Überlieferung erhalten geblieben, doch das doppelzeilige Baßcontinuo ermöglicht eine recht zuverlässige Nachvollziehung der restlichen Stimmen. Hier bin ich Dr. Lionel Pike für die Verfügbarmachung seiner ausgezeichneten, unveröffentlichten Rekonstruktion zu Dank verpflichtet. Über die Aufführungsbedingungen in der Hofkapelle zu Brüssel ist nur wenig bekannt. Fest steht, daß neben dem maître de la chapelle und zwei oder drei Organisten, die sicher ebenfalls sangen, wenn sie nicht spielten, insgesamt sechzehn Sänger bezahlt wurden. Instrumentalisten sind keine angegeben, jedoch zählte man zu Philips Lebzeiten „Fagottisten“, Harfenspieler, Violaspieler (zu denen auch der Engländer Daniel Norcombe gehörte) sowie Lautenspieler, von denen einige auch als Mitglieder der Kapelle bezeichnet werden, zu den weltlichen Hofmusikern. Unsere Version setzt diese Instrumente gemäß der in spanischen Kirchen damals üblichen Aufführungsweise ein, da man davon ausgehen kann, daß damals zwischen Spanien und seiner Kolonie in den Niederlanden starke musikalische Bindungen bestanden. Einer etablierten Praxis im zeitgenössischen Italien und Deutschland folgend, haben wir den Einzelcontinuo-Part von Philips achtstimmigen Motetten in zwei Parts und somit in einen Part pro Gruppe unterteilt. Bei den Motetten von Giovanni Gabrieli für mehrere Chöre zum Beispiel findet man im Originalmanuskript nur eine einzige Baßstimme vermerkt, während für einige von ihnen in deutschen Originalquellen verteilte Continuo-Parts angegeben sind. In Aspects of Keyboard Music: Essays in Honour of Susi Jeans (Oxford 1992, S. 141) bezeichnet John Steele Philips’ beiden Sammlungen von Cantiones sacræ als „den bedeutendsten Korpus lateinischer Motetten für Chöre von einem englischen Komponisten, mit der einzigen Ausnahme von William Byrd“. Da diese Sammlungen aber kaum Spuren von Philips Schulung in England aufweisen, sollte man sie unserer Meinung nach eher mit Musik wie der von Palestrina, Victoria, Soriano und Felice Anerio (zwischen 1584 und 1585 maestro di capella am englischen Kollegium) vergleichen, der Philips in Rom begegnet sein dürfte. Vergleicht man Philips achtstimmige Motetten mit den fortschrittlichsten Musikstücken seiner Zeit, wie zum Beispiel mit denen von Gabrieli, Schütz und Michael Praetorius, die sowohl hohe als auch tiefe Tonlagen für ihre Chöre komponierten und Solostimmen und Obligatoinstrumente einsetzen, so muß Philips Musik als eher konservativ gelten. In den Doppelchormotetten auf unserer Aufnahme wird die herkömmliche Kontrapunkttechnik reichlich verwendet. Die Hodie concepta est zum Beispiel zeigt eine dichte, imitative achtstimmige Vertonung, obwohl sie in lebhaften Hallelujas endet, bei denen ein Chor dem anderen in Blockakkorden antwortet. Die Salve regina dagegen beginnt mit Variationen des Anfangssatzes des Cantus planus, bevor es zu eher typischen Doppelchorvertonungen übergeht. Im großen und ganzen aber erzielen die Motetten ihre Wirkung durch Kontraste – zwischen den beiden Chören, zwischen dem Wechsel von Zweier- und Dreiertakt sowie zwischen eher langsamen Passagen in ganzen und halben Noten und schnelleren Passagen in Viertel- und Achtelnoten. Eine Motette wie die Ecce vicit Leo ist fast völlig homophon, mit einer hellen, wiederholt eingesetzten Figur bei den Worten „et benedictionem“, die aus der Schlachtmusik der Renaissance stammt. Philips Litanei in neun Stimmen ist ebenfalls größtenteils homophon. In ihr bildet ein in hoher Tonlage geschriebenes vierstimmiger Chorstück für die Stimme des Priesters den Kontrast zu einem in tiefer Tonlage geschriebenen Stück in fünf Stimmen für die Rolle des Volkes, wobei beide Stimmen ständig aufeinander antworten. In den Händen eines weniger begabten Komponisten hätten die ständigen Wiederholungen des „ora pro nobis“ leicht langweilig klingen können, aber Philips gelingt es mühelos, durch die Variation rhythmischer Muster und sie ständige Kadenzierung in verschiedenen Tonarten für Spannung zu sorgen.